Abstract: The motherboard is a pretty well rounded platform, it even supports HDTV component output (Y, Pb, Pr) by default! 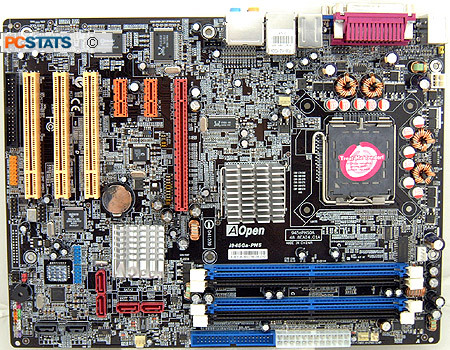 In the last year AOpen has really spruced up its retail motherboard image - gone are the days of bland solutions destined for system integrators; its motherboards now have flashy consumer-friendly colours and trendy features. Whether this has helped AOpen's retail motherboard sales remains to be seen, but AOpen's boards are certainly getting a lot more attention. At first glance, the AOpen i945Ga-PHS socket 775 Intel Pentium 4 motherboard is a pretty well rounded platform, it even supports HDTV component output (Y, Pb, Pr) by default! This is a feature that very few Intel motherboards can boast, and the AOpen i945Ga-PHS is only able to incorporate component outputs because is has a special chipset by Chrontel. Based on the Intel's i945G Northbridge, the AOpen i945Ga-PHS motherboard supports Socket 775 Pentium 4/D/XE and Celeron processors running with a 533/800/1066 MHz FSB. The four DDR2 memory slots can accommodate up to 4GB of PC2-6400 unbuffered DDR-2 RAM, while running in a dual channel configuration. Onboard goodies consist of an integrated videocard, Gigabit network card, Intel Azalia HD 7.1-channel audio codec, IEEE 1394a Firewire and an additional Silicon Image SiI3132 Serial ATA II/RAID controller. Should users need to expand beyond what the motherboard supports natively, there is one PCI Express x16 slot for a videocard, two PCI Express x1 slots for high bandwidth devices, and three traditional 32 bit PCI slots for legacy cards. There are a total of six SATA headers, though because of the i945G chipset only one IDE channel. Of course, the two most important features of the AOpen i945Ga-PHS motherboard are its integrated videocard and onboard component output for viewing HD content. 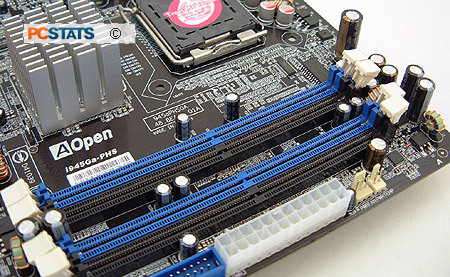 The overall layout of the AOpen i945Ga-PHS motherboard is good, and components like the main ATX and IDE connector are positioned to the right of the DIMM slots which keeps the cables away from the other system devices. AOpen does a good job at keeping all the header ports away from the expansion slots too, which makes it easy to keep the innards of a computer nice and organized. AOpen has done a good job at identifying the various ports and headers on the i945Ga-PHS motherboard. From the USB headers to IEEE 1394a, Serial ATA channels and DDR2 DIMM slots... there is always a label close by. 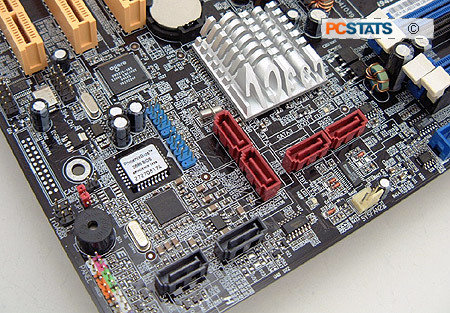 At first glance, the mention of an integrated PCI Express x1 two port Silicon Image SiI3132 Serial ATA II/RAID controller might seem like a minor point, but consider the following: with the Silicon Image SiI3132's port multiplier capabilities, users can potentially connect up to 60 SATA hard drives! Though just to be clear, you'll need to acquire the appropriate SATA port-multipler hardware first. Units connecting five SATA drives over one SATA cable are pretty easy to come by nowadays. The Intel i945G northbridge chipset does not support component output, but the motherboard does... so how did this come to be? AOpen engineers took the third-party Chrontel CH7021A-TEF chipset and integrated it onto the i945Ga-PHS motherboard via a PCI Express x1 lane. 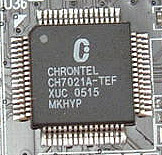 This Chrontel chipset gives the i945Ga-PHS component output (Y, Pb, Pr) support. Teamed up with Intel's Azalia high definition audio codec, and we have a powerful HTPC machine. The component output cables spawn from a black seven pin S-video-like connector on the rear I/O panel, just below the Parallel Port and to the left of the 15-pin analog VGA jack. 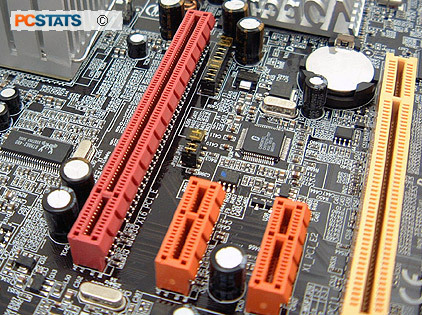 The AOpen i945Ga-PHS motherboard includes the necessary break-out cable which incorporates Component (Y, Pb, Pr), composite and S-Video outputs. The CH7021A-TEF chipset supports high definition modes between 480i and 1080P, as well as NTSC, PAL and SECAM colour modulation. In PCSTATS continuing effort to monitor the blown capacitor issue, we can report that the Aopen i945Ga-PHS motherboard uses TWZ, Luxon and Rubycon brand capacitors.